Cat Chat With Caren And Cody: "Year of the WHAT???!!!" 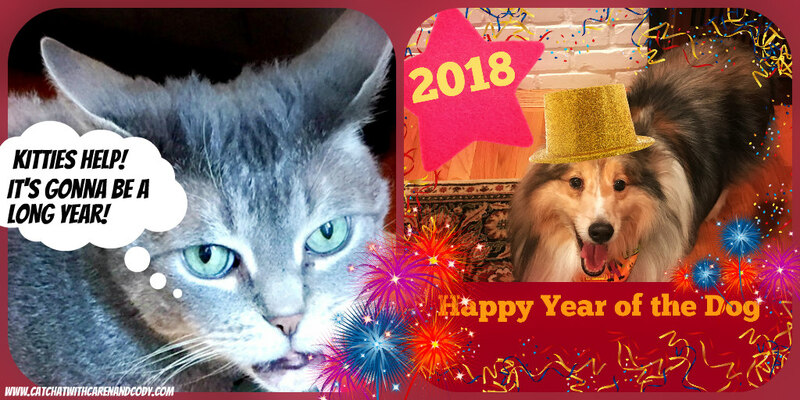 Bentley and Pierre are already claiming 2018 as their year! BOL! It's always the year of the cat here! Oh, so funny! And really, folks, don't you know it's NEVER Year of the Anything but KITTY. Everyone should have a chance to have their own year! Aww... don't !worry, Cody. It's always year of the cat! Well Cody I guess Dakota will be reminding you of that for a whole year.....be brave....you can handle him! Hell yeah I can handle him!! You kitties have been trying to take over the world, but now it is time for us dogs to be in the forefront once again :) Woof. CK says that's fake news, she might be on to something! I know, Cody ... it's a little disturbing to think that this year might be all about dogs! It's not all about dogs, Cody. Just ask your mom. She'll tell you the truth. I linked this post to Feline Friday, just for you. You made me smile. It might be the year of the dog but felines will get extra attention this year. so happy to make you smile!!! Yep we get extra attention every day every year!! Daisy Mae says I may not be a kitten but I'll help you get through the year. Also she wants to know when is the year of the cat? We cats demand equal time! Nope. It'll always be Year of the Cat here. Don't make us hiss at you! MOL! OMC Cody! You are gonna hear it from Dakota all year long. Maybe tell him it might be the Year of the Dog but it's in THE CENTURY OF THE CAT! Cody, it's an outrage! I'm not sure how you'll be able to live with Dakota. Of course, he's a dog so maybe he'll be nice and not lord it over you all year. Sometimes peeps just throw the dogs a bone but we know it's the same as always - the year of us! We feel for you, Cody. Happy Chinese New Year!We had fireworks last night as 70% of the people in our City (Richmond) are Asian so there was LOADS of celebrating! Oh wow. The Dog? Um...am I in an alternate universe or something? Don't worry Cody. Dakota knows that every year is the year of the cat ! We believe every year is Year of the Cat! Since cats rule the internet (really, the world) I guess we can let one year go to the dogs! Don't worry Cody, every year is the year of the cat. So far, Dalton hasn't realized that its a year for him...and I, Pipo will not inform him either, Hah! We know what you mean, Cody! Although our woofie Eddie is okay with this.